Too tired to cook tonight? You're not alone. Whether you've spent all day bogged down by conference calls, chasing energetic toddlers, schlepping between meetings, errands, and unexpected crises, or catering a meal for 200 wedding guests, sometimes the events of a long day are just too much. Even—or especially—for those who cook all day, the idea of coming up with a complete dinner seems defeating. Enter popcorn (and wine). "After a long day baking cakes and cookies, making buttercream, caramel sauce, ganache, lemon curd, and the like, sometimes I’m just too tired to prepare a meal, even a small one," pastry chef Gail Dosik, the founder of One Tough Cookie, Inc., admits. Yes, the "Olivia Pope dinner," as it's known in “Scandal”-watching circles, has become the de facto dinner for exhausted chefs, recipe developers, and food professionals who need sustenance without effort. But all self-deprecation and jokes about guilty pleasures aside, popcorn is one of the more nutritious "splurge" solo meals. It's actually a whole grain that's high in fiber but low in calories, making it a filling meal that doesn't require more than 10 minutes of work. "I see no difference between eating a bowl of good popcorn and eating a bowl of pasta for dinner, and the popcorn is full of fiber, unlike the pasta," says Erica Wides, chef, culinary instructor, and creator and host of "Let's Get Real" on The Heritage Radio Network. Ruggiero boosts her air-popped corn with a healthy dose of flavorful seasonings. "I add a touch of butter, some finely chopped rosemary, a dash of garlic powder, a sprinkle of kosher salt and a few grates of Parmigiano-Reggiano," she says. 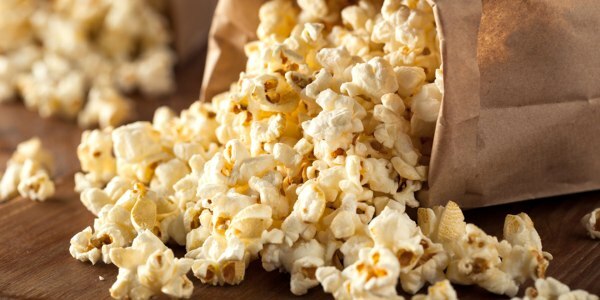 By sticking to small amounts of olive oil or unsalted butter, and sprinkling the popped kernels with fresh herbs or seasonings like smoked paprika, or nutritional yeast flakes, pro cooks boost their bowls of popcorn with tons of flavor while still keeping it healthy. Paired with a glass of prosecco and an episode or two of “Scandal”? Nothing guilt-inducing about that!